The final spot in the tournament will be determined in a qualifying match between Hikari and Miu on June 3rd. The winner of the tournament will receive a title shot at a later event. If you are new to Tokyo Joshi Pro I highly recommend you check out Heerokun’s Introduction to Tokyo Joshi Pro guide as it does a far better job of explaining things than I’d ever be able to. Let’s get straight to the first show on June 3rd! All wrestlers above have profiles on Joshi City, you can click on their name to go straight to it. As this event aired on DDT Universe, all matches are unclipped. Hikari and Miu are both popular young wrestlers affiliated with the Up Up Girls, and both have been wrestling for less than a year. They don’t really interact with the idol group that shares their name however as they are a separate unit, focused more on wrestling than singing (although they do that too). While the winner may not go far in the tournament, it will still be good experience for whichever rookie wins the match. They grapple to start, shoulderblock by Miu but Hikari returns the favor and starts on Miu’s leg. Hikari throws Miu in the corner and hits a jumping elbow, cover by Hikari but it gets two. 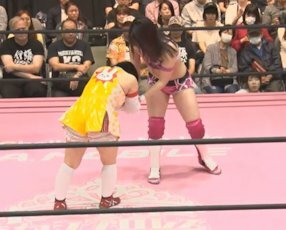 Back up they trade elbows until Miu clubs Hikari in the chest and puts Hikari in a crab hold, but Hikari gets into the ropes. Backbreaker by Miu, she picks up Hikari and throws her into the corner before hitting a body avalanche. Miu tosses Hikari to the mat, cover by Miu but it gets a two. Hikari fire back with a dropkick, Miu goes off the ropes and muscles Hikari up onto her shoulder but Hikari slides away and hits a dropkick. Hikari picks up Miu but Miu hits a scoop slam, Hikari slides away again however and puts Miu in an Cobra Twist. Cradle by Hikari, but Miu gets a shoulder up. Miu clubs Hikari in the chest with a Polish Hammer, she picks up Hikari and gets her onto her shoulder, but Hikari breaks the hold and cradles Miu for two. Hikari dropkicks Miu from behind, Leg Roll Clutch by Hikari and she gets the three count! Hikari wins and is now in the Tokyo Princess Cup! While it is clear these two are still rookies based on their skill level, they still made an attempt to tell a story. Even with no real knowledge going in, it was clear that Miu kept going for the same move that would have gotten her the victory, but Hikari kept avoiding it and eventually was able to defeat Miu as she had a bigger bag of tricks. Basic but fine enough, I don’t know if either will have a long career in wrestling but for this style of match I have no real complaints. Nodoka is a very popular young wrestler in Tokyo Joshi Pro, her rise within the promotion was gradual but she has started to pick up bigger wins in 2018 and appears posed to make a run to the top of the promotion. Yuna Manase debuted four years ago for Stardom and since then has had quite a journey, as she stopped by several promotions after leaving Stardom before ending up in Tokyo Joshi Pro in 2017. 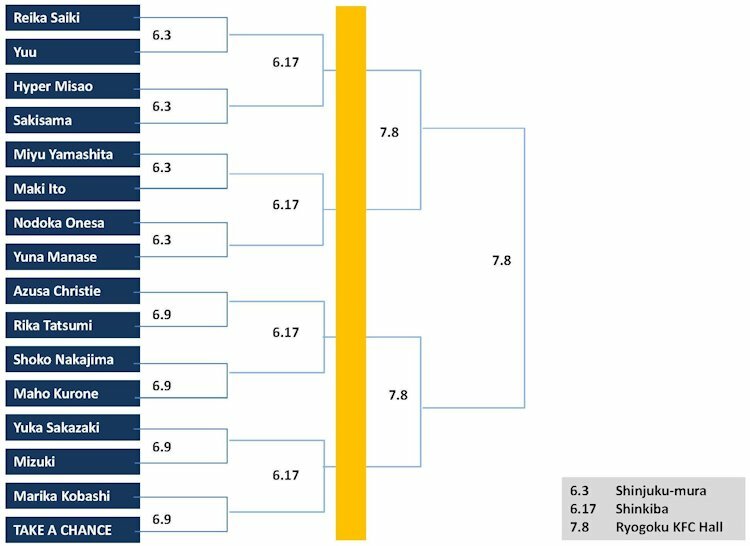 Yuna challenged for the Tokyo Princess of Princess Championship in February against Miyu Yamashita but came up short, so she’ll need to win this tournament if she wants another shot anytime soon. They begin the match trading wristlocks until Nodoka slaps on a headlock, Yuna gets out of it but Nodoka drops her with a shoulderblock. Nodoka goes off the ropes but Yuna returns the favor with her own shoulderblock, Yuna slams Nodoka’s knee into the mat before flinging her down by the hair. Irish whip by Yuna out of the corner but Nodoka reverses it and hits a running elbow, body press by Nodoka but it only gets a two count. Nodoka goes off the ropes but Yuna plants her with a big boot, snapmare by Yuna and she kicks Nodoka in the back before hitting a seated senton for two. Mounted elbows by Yuna and she puts Nodoka in a headlock, but Nodoka gets a foot on the ropes to force the break. Scoop slam by Yuna, she picks up Nodoka but Nodoka elbows her off and hits a scoop slam. Nodoka tries to get Yuna on her shoulders but Yuna blocks it, body block by Yuna and she hits an over-the-shoulder slam. Running chest bump by Yuna, she covers Nodoka but Nodoka barely gets a shoulder up. Yuna goes for a kick but Nodoka avoids it, diving bulldog by Nodoka but Yuna floors her again with a big boot. 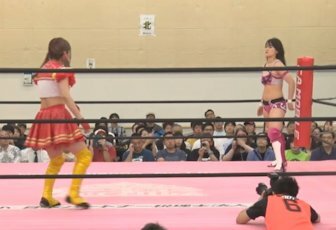 Nodoka dropkicks Yuna into the corner but Nodoka quickly hits a Back Flip (Samoan Driver) for a quick three count cover! Nodoka continues in the tournament. Nodoka is fiery, I like her quite a bit, but Yuna still doesn’t do a lot for me. There is a reason that Yuna has bounced around so much early in her career, she does the fundamentals well but doesn’t really bring anything special to the table. She did a good enough job as just being a foil for Nodoka but for two wrestlers that know each other well the chemistry wasn’t really there with some of the transitions. The match also felt like it ended really quickly as Yuna didn’t feel worn down at all and the Back Flip isn’t a killer move. A decent enough mid-card match but nothing more than that. I have a feeling this will be a “more style than substance” type of match. Hyper Misao is an interesting character as she is basically a super hero that claims to be good but actually cheats much of the time or tries to win by underhanded means. She still is fairly popular though as her shenanigans are usually more funny than mean spirited/heelish, but she hasn’t really gotten out of the midcard. Saki is the main heel in Tokyo Joshi Pro and leads a group called NEO Biishikigun, the main heel faction in the promotion. She has held the Tokyo Princess Tag Team Championship this year but has yet to ever challenge for the Princess of Princess Championship so winning this tournament would get her a chance for the big belt. Even before the match starts, Misao is already being shady as she tells Saki she has stolen some of her stuff and unless she forfeits the match, she won’t get it back. Saki has none of this and boots Misao hard in the face, cover by Saki but Misao kicks out and bails out of the ring. Saki goes out after her but Misao knocks her down and runs away, she disguises someone at ringside in her attire and hides before Saki recovers. Saki sees the impostor but realizes it is not the real Misao, Saki finds her but Misao bails again and runs up the stairwell near ringside. Saki follows her but Misao throws the curtain at her, she then busts out some tape and tapes Saki’s hand to the guardrail. 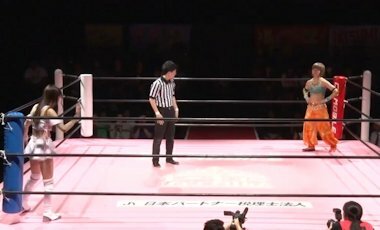 Misao runs back into the ring as the referee’s count continues, but Saki slips out of her glove to get loose and makes it back before the 20 count. Running elbow by Misao and she rams Saki’s head into her knee, Misao exits the ring and comes back with a chair, but the referee stops her from using it. By now Saki has recovered and she boots Misao in the chest, Saki whips at Misao before kicking her in the back of the head for a two count. Saki applies a headscissors but Misao makes it to the ropes, Saki goes off the ropes and she boots Misao out of the ring. Saki gets on the apron and goes to kick Misao, but Misao throws a chair at her leg. Misao tapes up Saki’s legs and tries to return to the ring but Saki grabs her, and Saki returns the favor by taping up Misao’s legs. They both roll back into the ring, taped up legs and all, and Misao gets her chair. Misao hops over to Saki but the referee tries to take the chair from her, he fails however and goes flying backwards and out of the ring. Misao hops again over to Saki but Saki knocks her back, roll-up by Misao but the referee isn’t around to count it. Saki and Misao both free their legs, Misao goes to find the referee but Saki kicks her from behind. 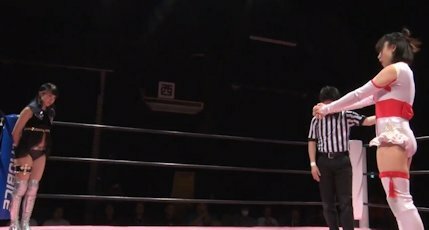 Saki applies a figure four headlock but lets go since there is no referee still, she goes and collects the referee but Misao promptly accidentally elbows him in the corner. Big boot by Saki in the corner but Misao comes back with a crossbody, she crawls to the corner and gets the tape again, but Azusa Christie runs down to help Saki. Azusa frees Saki with scissors, Misao comes back with some type of spray and sprays it into both Saki and Azusa’s eyes. Misao tosses the bottle to Saki as she goes to wake up the referee, and then takes off her own mask and puts it into Saki’s hands as well. 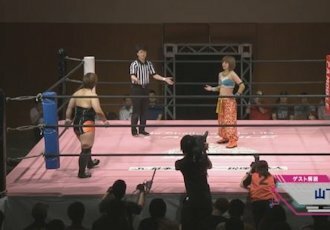 As the referee finally recovers, Misao tells him that Saki cheated and stole her mask, and the referee disqualifies Saki! Hyper Misao wins and advances in the tournament. I am not going to be able to do the Maki Itoh Craze justice in this short intro, but Maki is a very popular wrestler in Tokyo Joshi Pro that just started wrestling in 2016. While her in-ring technique is still improving, her promos/charisma/general attitude are top notch and have gained her quite a following in the last six months. She has an uphill battle here however, as in the first round she drew current Princess of Princess Champion who has not lost a singles match since August of 2017. Maki will have to pull off a big upset to continue her run in the Tokyo Princess Cup. The match starts with wristlocks, headlock by Miyu but Maki elbows out of it. Miyu charges Maki but Maki moves, Maki goes for mounted punches in the corner but Miyu slides away and hits Maki from behind. Miyu goes off the ropes but Maki greets her with a hard elbow, shoulder tackles by Maki in the corner and she finally hits her mounted punches. Maki goes off the ropes but Miyu avoids her attack, stomps by Miyu and she kicks Maki in the back for a two count. Miyu clubs Maki in the back and applies a headscissors, but Maki wiggles to the ropes to force a break. Miyu goes off the ropes and dropkicks Maki in the back, Irish whip by Miyu which is reversed by Maki, but Maki misses a dropkick. Back up they trade strikes, Miyu goes off the ropes but Maki catches her with a dropkick. Scoop slam by Maki and she covers Miyu for a two count. Elbows by Maki but Miyu knees her in the stomach, battering ram by Maki and she hits a falling headbutt for two. Maki headbutts Miyu but Miyu gets her back, elbows by Maki but Miyu returns fire. Miyu goes for a high kick but Maki catches it, headbutts by Maki and she finally knocks Miyu to the mat. Maki puts Miyu in a crab hold but Miyu inches to the ropes for a break. Maki gets on the second turnbuckle but Miyu avoids her body press, now Miyu goes up top and hits a missile dropkick for two. Miyu picks up Maki but Maki slides away, knee by Miyu but Maki elbows her back. High kick by Miyu, she picks up Maki but again Miyu slides off and hits a DDT. Miyu puts Maki in a deep clutch Boston Crab but Miyu is able to make it to the ropes, Maki picks up Miyu and she hits a long series of headbutts. Maki goes off the ropes but Miyu catches her with a pair of high kicks, Attitude Adjustment by Miyu and she picks up the three count! Miyu Yamashita wins and advances in the tournament. 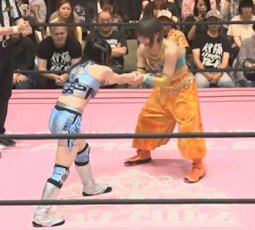 This is a pretty big match as it pits two former Princess of Princess Champions against each other, with Reika holding the title more recently as she lost it earlier in 2018. Reika is technically a Freelancer but spends a lot of time in Tokyo Joshi Pro, she comes into the match holding half of the Princess Tag Team Championships and has improved dramatically since debuting just two years ago. Yuu is Tokyo Joshi Pro’s strongest wrestler and is tough to beat, she also debuted in 2016 so experience-wise it is a very even match. The match begins with a test of strength, naturally, which Yuu initially wins but Reika gets in top position. Yuu gets back in control but Reika gets into the ropes for the break, headlock by Yuu but Reika gets out of it and they collide with neither wrestler going down. Reika gets Yuu to the mat and kicks her in the back, she picks up Yuu and dropkicks her before hitting a hip toss for a two count. Reika throws Yuu into the corner but Yuu elbows her, Reika returns with an elbow of her own and she puts Yuu in a camel clutch. Yuu gets to the ropes for the break, Reika goes off the ropes but Yuu catches her with a spinning side slam. Reika quickly comes back with a backdrop suplex, Reika picks up Yuu and goes for the Tower Bridge, but Yuu slides away and hits the Oklahoma Stampede. Yuu picks up Reika, Reika goes for a leapfrog but Yuu catches her and slams Yuu to the mat. Senton by Yuu, but Reika kicks out of the cover. Back up they trade strikes until Yuu chops Reika to the mat, Yuu picks up Reika but Reika knocks her back and the battle continues. Irish whip by Yuu and she chops Reika to the mat again, cover by Yuu but it gets a two count. Yuu picks up Reika, Reika goes off the ropes but Yuu drops her with a judo throw. Yuu applies a cobra clutch but Reika quickly gets into the ropes, Yuu charges Reika but Reika leapfrogs over her and dropkicks Yuu into the corner. Reika grabs Yuu and puts her in the Tower Bridge, but quickly tosses her back down and stomps on Yuu’s back. Missile dropkick by Reika, she waits for Yuu to get up but Yuu ducks her kick and re-applies the Cobra Clutch. Reika gets out of the hold and goes for the Shining Wizard, but Yuu catches her and hits a buckle bomb. Last Ride attempt by Yuu but Reika slides away and hits a Shining Wizard to the back of Yuu’s head. Head kick by Reika, she picks up Yuu and goes for the Jackhammer, but Yuu blocks it and hits a hard elbows. John Woo by Yuu, she drags up Reika and she nails a Last Ride for the three count pinfall! Yuu picks up the win and advances in the tournament. As I mentioned above, the first two matches of the tournament had forfeits, so we jump straight to the semi-main on the event to have our first tournament match. Azusa Christie is part of NEO Biishikigun, the heel stable run by Saki-sama. Since joining with Saki, Azusa has found a lot more success as she left her old Idol life be Saki’s devoted helper. Rika Tatsumi has been feuding with NEO Biishikigun for much of 2018, she was in a popular tag team with Maho Kahone but without her friend around she is on her own to battle one of her biggest enemies. They jockey for position in the ropes as the match begins, Irish whip by Rika but she can’t shoulderblock Azusa over. Azusa throws down Rika by the hair and into the corner, kicks by Azusa and she knocks Rika out of the ring. Azusa goes out after her and rams Rika into the apron, Azusa whacks Rika with a weapon before rolling her back into the ring. Rika greets Azusa with boots and hits a face crusher, hip attack by Rika and she hits an elbow drop for a two count. Rika kicks Azusa in the leg and applies a cross kneelock, she picks her up after a moment and drops Azusa with a dragon screw leg whip. Kneebreaker by Rika, but Azusa kicks out of the cover. Irish whip by Rika but it is reversed, Azusa knocks Rika to the mat but Rika recovers and the two trade strikes until Azusa applies a crucifix into a cover for two. Azusa keeps hold of her arms and applies a double armbar, she lets go and picks up Rika, but Rika gets Azusa in the corner and dropkicks her in the leg. Dragon screw by Rika and she quickly puts Azusa in the figure four, but Azusa makes it to the ropes for the break. Rika picks up Azusa but Azusa blocks the cutter and hits a Codebreaker, running forearm by Azusa but her cover gets two. Azusa and Rika trade elbows, hip attack by Rika and she twists on Azusa’s leg before hitting another quick hip attack for two. Cutter by Rika, she goes up top but Azusa avoids the diving hip attack and hits a running facecrusher. Azusa kicks Rika twice in the chest but Rika hits a backbreaker, sleeper by Rika and she reverts it into a Dragon Sleeper. Azusa struggles for a moment but eventually has to tap out! Rika Tatsumi wins and advances in the tournament. Not an overly exciting match but pretty well executed. Rika has a lot of fire and I like her offense, but her offense doesn’t really fit together as she was focusing on different parts of Azusa throughout the match. The potential is there, she just needs to tie it all together. Azusa was a bit clunkier, but the bigger issue is that I never really saw her as winning the match. Even without any backstories, just as a casual viewer it always felt like it was Rika’s match to win. Decent enough but it still feels like everyone is holding back a bit for the later rounds of the tournament. Yuka Sakazaki is one of the most accomplished wrestlers in Tokyo Joshi Pro, as she has had both a Princess of Princess and a Princess Tag Team Championship run in the last year. She is also one of the most exciting wrestlers they have as she has flashy offense and is a crowd favorite. Mizuki is the veteran of the tournament as she has been wrestling since 2012, she started in LLPW-X but left the promotion in 2017 to become a Freelancer. Since being a Freelancer, Tokyo Joshi Pro has been one of her main homes as she has been a regular there in 2018. With her experience it is hard not to respect Mizuki, even though Yuka is one of the top wrestlers in the promotion. Mizuki quickly goes for flash pins but Yuka kicks out of each one, she returns the favor with a few flash pins of her own but she can’t get the three count either. Eventually both wrestlers roll out of the ring exhausted from the flash pin sequence, but they return after a moment with Yuka taking control. Yuka works over Mizuki on the mat and then in the corner, elbows by Yuka and she covers Mizuki for a two count. 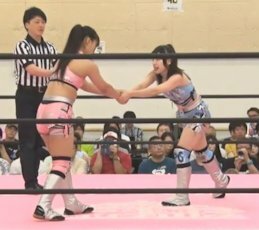 Yuka’s methodical offense on Mizuki continues until Mizuki flings Yuka out of the ring, Mizuki goes up top but Yuka quickly rolls back in and twists Mizuki’s leg in the top rope. Snapmare by Yuka down to the mat and she covers Mizuki for two. Yuka picks up Mizuki and throws her into the corner, running elbow by Yuka and she delivers a high kick for another two count. Yuka knocks Mizuki into the corner again but this time Mizuki scores with five straight dropkicks, hard elbow by Mizuki and she connects with a tilt-a-whirl headscissors which sends Yuka out of the ring. Mizuki goes up top and dives out onto Yuka with a crossbody, she gets Yuka back into the ring and puts her in a leg submission. Stretch hold by Mizuki, she lets go after a moment and hits a cartwheel into a body press for two. A leg scissors roll-up also gets two, she goes for a wheelbarrow but Yuka catches her and slams Mizuki to the mat. Yuka gets on the second turnbuckle but Mizuki dropkicks her as she jumps off, Mizuki throws Yuka into the corner but Yuka elbows her as she charges in and hits a dropkick of her own. Mizuki falls out of the ring, Yuka charges the ropes and dives out onto her with a springboard plancha. Yuka slides Mizuki back in, Yuka slams Mizuki and puts her in an armbar, but Mizuki rolls to the ropes for the break. Rolling snapmare by Yuka and she delivers a sliding lariat, Yuka goes up top but Mizuki gets her knees up on the diving body press attempt. Both wrestlers are slow to get up and they trade elbows as they do so, running elbow by Yuka and she kicks Mizuki in the stomach, but Mizuki drop toeholds her into the ropes and dropkicks Yuka in the back. Mizuki gets on the second rope and hits a diving footstomp, cover by Mizuki but it gets two. Crossface by Mizuki but Yuka quickly counters it, ankle hold by Yuka but Mizuki crawls to the ropes for the break. Yuka rolls Mizuki to the mat but Mizuki catches her sliding lariat attempt and applies a crossface, she lets go after a moment and applies a stretch hold but Yuka gets into the ropes. Back up, enzuigiri by Yuka and she goes off the ropes, but Mizuki catches her with the Cutie Special. Mizuki goes up top and delivers the diving footstomp, but Yuka kicks out of the cover. Elbows by Mizuki and she cradles Yuka, but Yuka reverses it for her own two count. Discus elbow by Yuka and she delivers the Merry Go Round, she goes out to the apron and nails the Magical Magical Girl Splash for the three count! Yuka Sakazaki wins and advances! All wrestlers above have profiles on Joshi City, you can click on their name to go straight to it. As this event aired on DDT Universe, all matches are unclipped. Since I already gave a brief summary for the wrestlers before their first round matches, from now on we will just get straight to the matches. After some introductory hold trading, Yuka gets Hikari on the mat and starts working on her leg. Hikari gets out of it and they return to their feet, Yuka goes off the ropes and hits an armdrag but Hikari returns the favor and hits a dropkick. Yuka rolls out of the ring to re-group, Hikari goes out after her but Yuka quickly returns to the ring. Yuka kicks Hikari as she comes through the ropes, leg drop by Yuka and she puts Hikari in a chinlock. Snapmare by Yuka, she picks up Hikari and throws her into the corner before stomping Hikari through the ropes. Yuka gets on the second turnbuckle and applies a headscissors over the top rope, she lets go after a moment and covers Hikari for a two count. Back up, elbows by Hikari but Yuka hits a drop toehold and puts Hikari in a STF. 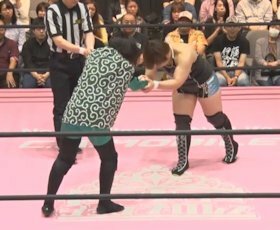 Hikari gets to the ropes for the break, Irish whip by Yuka to the corner and she hits a running elbow. Hikari comes back with a dropkick, more dropkicks by Hikari but Yuka catches her with a dropkick of her own. Hikari puts Yuka in a cobra twist, rolling cradle by Hikari but Yuka gets a shoulder up. Yuka hits a hard elbow but Hikari elbows her back, roll-up by Hikari but it gets two. Enzuigiri by Yuka and she drives Hikari’s head into the mat, Yuka goes off the ropes and hits Hikari with a sliding lariat. Yuka goes up top but Hikari tosses her off, Hikari then goes up top and she hits a missile dropkick for a two count. Hikari applies a sleeper, she rolls it into a Japanese Clutch but Yuka kicks out. Hikari picks up Yuka but Yuka gets away from her and pushes her to the mat, Yuka rolls Hikari to the middle and puts her in the Omoplata, and Hikari has to submit! Yuka Sakazaki advances to the Semi Finals! I love Yuka Sakazaki but there wasn’t much to this one. Hikari is too green to really hang with Yuka and so it was a very toned down more mat-based match. They gave Hikari a few hope spots, which was polite but none were particularly convincing and then the match suddenly ended with a slow developing submission hold. Definitely the most skippable match of the tournament thus far, course Hikari advancing in the first place likely wasn’t the plan so they had to do the best they could with the cards they were dealt. Like the last match, this one begins methodically as they both grapple for the upper hand. Irish whip by Miyu, she kicks Nodoka but Nodoka fires back with a hard shoulderblock. Nodoka picks up Miyu and hits a snapmare before delivering a body press. 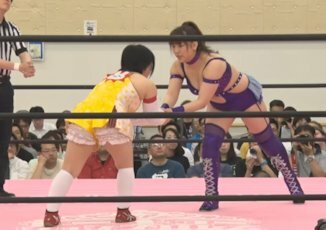 Nodoka kicks Miyu into the corner but Miyu switches positions with her and hits a series of elbows. Kick to the back by Miyu and she applies a chinlock, but Nodoka gets to the ropes for the break. Irish whip by Miyu and she knees Nodoka in the gut, sliding kick by Miyu and she covers Nodoka for two. Another kick to the back by Miyu and she goes for Nodoka’s arm, but Nodoka rolls her up for two. Knee by Miyu and she picks up Nodoka, but Nodoka slides away and hits a backbreaker. Nodoka goes off the ropes but Miyu catches her with a knee to the stomach, another knee by Miyu but Nodoka elbows her in the back of the leg and hits a low crossbody for a two count. Nodoka chokes Miyu with her leg but Miyu quickly gets into the ropes, Irish whip by Nodoka and she hits a back elbow, running body press by Nodoka but Miyu kicks out. Nodoka gets on the second turnbuckle but Miyu gets her knees up when she jumps off, push kick by Miyu and she hits a second one, kick combination by Miyu but Nodoka catches one and elbows Miyu in the leg. Miyu comes right back with a hard high kick, she knocks Nodoka into the corner and delivers a jumping knee. Miyu picks up Nodoka but Nodoka gets away and hits a shoulderblock, Nodoka picks up Miyu and she hits a scoop slam. Nodoka gets on the second turnbuckle and hits a diving body press, she applies the WAR Special but Miyu gets out of it and hits a lariat. Back up, elbows by Nodoka but Miyu kicks her in the back of the head. Another kick by Miyu, she goes off the ropes and she kicks Nodoka in the head. Miyu picks up Nodoka and nails the Attitude Adjustment, but Nodoka gets a shoulder up at two. Miyu goes up top but Nodoka recovers and joins her, she gets Miyu on her shoulders and delivers an Avalanche Back Flip. Cover by Nodoka, but Miyu barely kicks out. Miyu is up first, she picks up Nodoka but Nodoka elbows her. Miyu returns with a kick, another head kick by Miyu but when she goes off the ropes she eats a hard Nodoka elbow. Backflip by Nodoka, and she picks up the three count! Nodoka wins the match and advances in the tournament. If you think that Hyper Misao would have too much respect to try her shenanigans against the serious Yuu, you would be incorrect. Yuu tosses Misao around but Misao escapes and asks for a handshake. 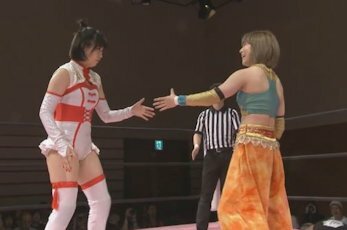 Yuu shakes her hand as everything is still going well, they trade wristlocks and trips on the mat but neither can get the advantage. Another handshake but this time Misao slaps on an inside cradle for two, she goes for a couple more flash pins but Yuu kicks out each time. Misao bails out of the ring with Yuu chasing after her, Misao goes under the ring but Yuu waits for her to emerge and chops Misao against the apron. Yuu slides Misao back in, chops by Yuu and she covers Misao for two. Misao goes off the ropes but Yuu catches her with a shoulderblock, she now goes off the ropes and hits a second shoulderblock on Misao. Misao jumps out of the ring again and goes under the ring, Yuu goes under the ring after her but Misao shows up first and attacks Yuu as she gets back to the floor. Yuu recovers and tosses Misao into the apron and then into the wall, but Misao throws Yuu into the ring post and gets some duct tape. Misao tapes Yuu to the wall (slightly off camera), but the plan doesn’t really work and Yuu breaks free to return to the ring before the 20 count. Misao begs off Yuu but Yuu approaches her anyway, Misao throws Yuu into the corner but Yuu catches her attack and slams her to the mat. John Woo by Yuu and she hits a running elbow, another elbow by Yuu and she covers Misao for two. Yuu elbows Misao in the corner, Irish whip attempt by Yuu but Misao reverses it and “accidentally” throws Yuu into the referee. While the referee is out, Misao sprays Yuu in the eyes with cold air spray before taking off her own mask and handing it to Yuu. The referee recovers, but Misao forgot to give Yuu the cold air spray so she still has it in her hand. She tries to play it off by spraying herself but the referee isn’t having it, as he appears to finally be getting wise to Misao’s tricks. Misao gets her mask back on, Misao shakes Yuu’s hand again but Yuu catches her kick and hits a double chop. More chops by Yuu, Irish whip and she hits a spinning sidewalk slam for two. Yuu grabs Misao, Misao slides away but Yuu scoops her up and goes for the Oklahoma Stampede. Misao blocks it and applies a chickenwing, but Yuu gets to the ropes. Misao goes for the Final Cut but Yuu blocks it, Misao goes off the ropes but Yuu catches her with a powerslam. Misao avoids Yuu’s senton and applies La Magistral, but Yuu kicks out. Misao rams Yuu’s head into his knee, she gets on the second turnbuckle and delivers a diving crossbody for two. Misao knocks Yuu into the corner but Yuu catches her with a Judo Toss when she charges in. Yuu grabs Misao and puts her in a One Wing Twist, and Misao taps out! Yuu wins and advances in the tournament. Finally I get to see Shoko, since she had a bye in the first round this is our first look at the former Princess Tag Team Champion. They end up on the mat to start and jockey for position, back on their feet Rika takes control until Shoko flings her to the mat and scores a quick cover. They trade pins with neither having any luck, Rika shakes Shoko off and knocks her down with a dropkick. Shoko headscissors Rika over the top rope to the floor, Rika rolls back in but Shoko avoids her charge and applies a stretch hold in the ropes. Shoko goes off the ropes and dropkicks Rika in the head, cover by Shoko but it gets two. Shoko picks up Rika and knees her in the back but Rika hits a scoop slam, Rika elbows Shoko in the leg and applies a submission, she lets go after a moment but only to ram Shoko’s leg in the apron before twisting her leg in the ring post. Rika gets back on the apron and dropkicks Shoko’s leg while it is against the post, cover by Rika but it gets two. Irish whip by Rika but Shoko reverses it, Shoko goes for a kick but Rika hip attacks her in the leg. Kneebreaker by Rika, she picks up Shoko and tosses her out of the corner, but Shoko flips her out to the apron and dropkicks Rika to the floor. Shoko goes off the ropes and dives out onto Rika with a tope suicida, they both return to the ring and Shoko throws Rika into the corner before hitting a running elbow and bulldogging Rika into the turnbuckles. Missile dropkick by Shoko and she covers Rika for two. Shoko picks up Rika and she hits a butterfly suplex, dropkick by Shoko but Rika blocks the Tiger Feint Kick and hits a dragon screw in the ropes. Dropkick to the leg by Rika and she hits a couple hip attacks, elbow drop by Rika and she covers Shoko for two. Rika picks up Shoko but Shoko rolls it into a grounded headlock, cradle by Shoko but Rika blocks it and applies the figure four leglock. Shoko gets to the ropes for the break, Rika picks up Shoko but Shoko cradles her for two. Hurricanrana by Shoko, but that gets a two as well as does the Northern Lights Suplex. Shoko elbows Rika but Rika elbows her back as they trade blows, hip attack by Rika but Shoko comes back with a dropkick. Rika ducks the first Tiger Feint Kick attempt but Shoko hits it over the bottom rope instead, she goes up top but Rika avoids the diving senton. Rika picks up Shoko and hits a modified cutter, she hip attacks Shoko in the head and covers her for two. Rika goes up top but Shoko elbows her before she jumps off, Shoko joins her and hits a Frankensteiner but is too hurt to make a cover. She finally gets an arm on Rika, but Rika gets a shoulder up. Shoko picks up Rika and delivers the double arm DDT, she goes for another Northern Lights Suplex but Rika blocks it and hits a cutter. Rika puts Shoko in the sleeper, she tries to revert it into a Dragon Sleeper but Shoko rolls her up for two. Shoko goes off the ropes but Rika catches her with a backbreaker, she gets the sleeper applied again and this time successfully switches it to the Dragon Sleeper. Shoko struggles but Rika grapevines her and Shoko has to tap out! Rika Tatsumi wins and advances! Per usual, all wrestlers above have profiles on Joshi City, you can click on their name to go straight to it. As this event aired on DDT Universe, all matches are unclipped. They circle each other to start, they both try to knock each other over until Yuu sends Nodoka to the mat first. Nodoka gets back up but Yuu elbows her, snapmare by Yuu and she chops Nodoka repeatedly in the chest for a two count. Back up, chop by Yuu but Nodoka shoulderblocks her down for a two count. 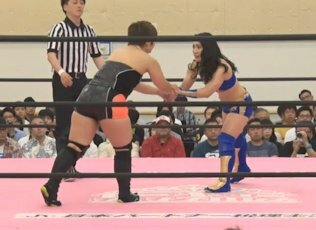 Body press by Nodoka, she throws Yuu into the corner and hits a running elbow. Low crossbody by Nodoka, but Yuu kicks out. Yuu recovers and chops Nodoka in the chest but Nodoka elbows her back and the two trade blows. Nodoka elbows Yuu into the corner, Irish whip by Nodoka but Yuu catches her and flings Nodoka to the mat. John Woo by Yuu followed by a running elbow strike, cover by Yuu but Nodoka gets a shoulder up. Yuu scoops up Nodoka but Nodoka slides away, kick by Nodoka but Yuu grabs her and hits a spinning sidewalk slam. Running senton by Yuu, but it only gets two. Yuu picks up Nodoka but Nodoka reverses the Last Ride attempt with a back bodydrop. Yuu throws Nodoka into the corner but Nodoka boots her as she charges in, diving bulldog by Nodoka and she hits a backbreaker. 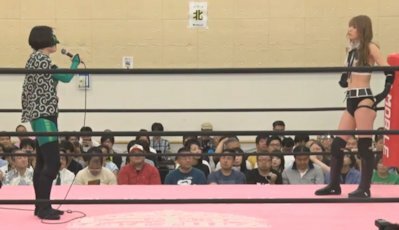 Nodoka gets on the second turnbuckle and hits a diving body press, but it only gets two. Nodoka goes all the way up but Yuu recovers and joins her, Nodoka kicks her back off however and hits the diving body press for a two count. Nodoka puts Yuu in the WAR Special but Yuu muscles out of it and hits a monkey flip. Nodoka snaps off a Back Flip, but Yuu gets a shoulder up at two. Judo toss by Yuu, but Nodoka quickly rolls up Yuu for two. Nodoka goes off the ropes but Yuu hits another judo toss, she puts Nodoka in the Katahajime and Nodoka goes unconscious. The referee calls for the bell, awarding the match to Yuu by referee stoppage! Yuu advances to the Finals of the Tokyo Princess Cup. Rika acts like she wants to shake Yuka’s hand but Rika slaps her and goes for the cutter. Yuka pushes her off but Rika cradles her for two, a few more flash pin attempts by Rika but Yuka kicks out each time. Yuka bails from the ring to re-group, Rika goes out after her but Yuka beats her down before sliding her back into the ring. Yuka elbows Rika in the back while she hangs over the bottom rope, she gets back in the ring herself and covers Rika for two. Yuka armdrags Rika and dropkicks her, but Rika pushes Yuka back and dropkicks her in the knee. Rika keeps on Yuka’s leg and applies a kneelock, she twists Yuka’s leg in the ropes and snaps it as she jumps out of the ring. Cover by Rika, but Yuka kicks out. Rika continues attacking the leg but Yuka rolls out of the way of the elbow drop and keeps rolling right out of the ring. Rika goes after her as Yuka tries to crawl back into the ring and drops her onto the apron. Rika puts Yuka’s leg around the ring post and slams it into it before delivering a dropkick. Rika rolls Yuka back in and throws her into the corner, Yuka goes off the ropes but Rika kicks her in the stomach. Running elbow by Yuka, she rolls Rika to the mat and delivers the sliding lariat. Yuka springs up to the top turnbuckle and hits the missile dropkick, but Rika rolls out of the ring. Yuka goes off the ropes and springboards down onto Rika, Yuka gets Rika into the ring and covers her for a two count. Yuka slams Rika into the mat and goes for a submission, but Rika quickly grabs the ropes. Sliding lariat by Yuka, she goes up top but Rika recovers and hits a dragon screw off the top turnbuckle to the mat. Grounded dragons crew by Rika and she hits the short-range hip attack for two. Figure Four by Rika, but Yuka inches to the ropes and forces the break. Back up they trade elbows, running elbow by Yuka but Rika hits a hip attack. Yuka returns with a kick of her own and both wrestlers fall to the mat, they trade elbows as they get back up, with Yuka winning the battle with a discus elbow smash. Yuka goes to do a springboard move but Rika stops her and hits a cutter, Rika goes up top and nails a diving hip attack for a two count. Rika puts Yuka in a Dragon Sleeper but Yuka pushes Rika’s shoulders to the mat so she has to break the hold. Rika goes for a backdrop suplex but Yuka lands on her feet and hits an enzuigiri, Yuka picks up Rika and nails the Merry Go Round. Yuka goes to the apron and delivers the Magical Magical Girl Splash, and she picks up the three count! Yuka Sakazaki wins and advances to the Finals! Yuu won’t shake Yuka’s hand before the match, as she is all business. They quickly end up on the mat as they grapple for position, but they eventually end up back on their feet as Yuu applies a wristlock. Yuka reverses it and dropkicks Yuu, she knocks Yuu into the corner and hits a monkey flip, but Yuka quickly gets into the ropes. Yuka goes off the ropes and hits a Sliding Lariat, she goes for a swandive move but Yuu moves and Yuka crashes to the mat. John Woo by Yuu but Yuka avoids her running elbow, Yuka knocks Yuu back to the middle of the ring and goes up top, but Yuu catches her dive. Yuka slides away and hits the Complete Shot, she goes off the ropes and goes for a lariat, but Yuu catches her and slams Yuka to the mat. Yuu applies a choke but Yuka gets out of it and applies an armbar, but Yuu gets into the ropes for the break. Yuka goes off the ropes and delivers a sliding lariat, Yuka goes to the apron and goes for another swandive move, but Yuu catches her and hits a Buckle Bomb. Cover by Yuu, but Yuka kicks out. Yuu picks up Yuka and she nails the Last Ride, and she picks up the three count! Yuu wins the match and the Tokyo Princess Cup! A more condensed match than one would hope for as a tournament final (under ten minutes), but at least what they did was decent. My main issue is that Yuka never felt like she was about to win, both times she went to the apron Yuu was up before Yuka could even think about doing a move, and Yuu was constantly cutting her off each time it looked like Yuka was getting the upper-hand. If the idea here was to make Yuu look really strong, they did that, but for the long journey I just went on it didn’t feel like that big climax that I was hoping for. It felt more like two quality wrestlers having a fun midcard match than the finals of a promotion’s biggest tournament of the year. Not a bad watch but overall disappointing since it was the finals and not on the level I was expecting. As a casual Tokyo Joshi Pro viewer (at best), while the tournament had a lot of really solid action it was missing a few key things. First, it was missing that great match that I could recommend to someone that wasn’t already watching the promotion. There were several really entertaining matches and lots of good matches, but nothing that rose to that ****+ level. This was due to a number of things, most of the matches weren’t very long and some were pretty basic based due to the experience level of the wrestlers involved. The other issue is that the Finals was disappointing, as if you are watching such a long tournament there is some expectation that the last match will be an epic climax of some sort and we definitely didn’t get that (even though the match was fine). 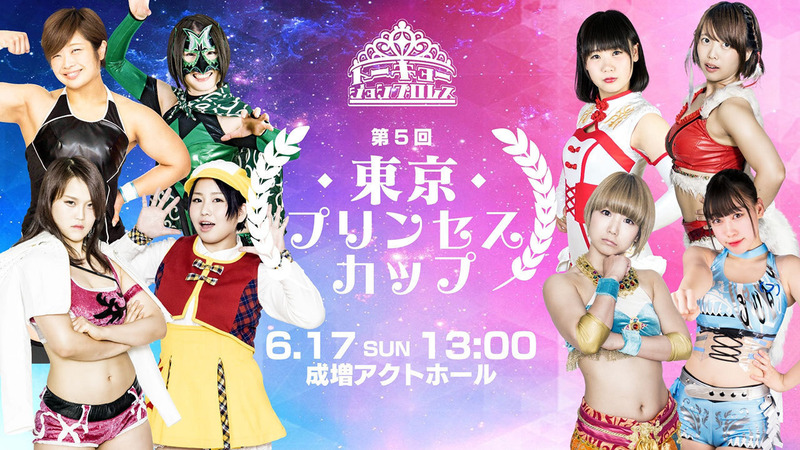 Overall I couldn’t recommend this entire tournament to a casual Joshi fan but some of the individual matches I definitely can as wrestlers such as Rika Tatsumi, Nodoka, and Miyu Yamashita in particular were impressive. A bit of a mixed bag for me, more good than bad for sure but it is difficult for me to give it a hard recommendation when considering everything together.